Holidays don't come much more glamorous than chartering a luxury yacht on one of the Mediterranean's beautiful coasts. Whether you're headed to Cannes or Capri, cultivating a capsule wardrobe that caters for everything from swimming and sunbathing to sophisticated soirees is no mean feat. This yachting season make sure you get the dress code right with our guide to Mediterranean-appropriate looks for day and night for both him and her. 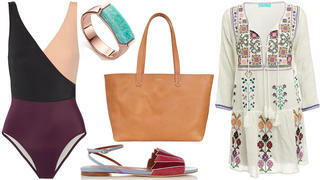 The perfect Mediterranean daytime look should cater for impromptu swims, tender trips, shopping and casual lunches. Invest in a slice of true dolce vita with Solid & striped block colour swimming costume. Keep a pretty cover-up by Melissa Odabash in this versatile Clare V leather tote - there is no summer look more classic than a white dress and tanned skin - and finish with Malone Soulier's colourful suede sandals and a sea-inspired jewel from Monica Vinader for an outfit guaranteed to get you in the holiday mood. Whether it's a cocktail party on a neighbouring superyacht or a private dinner on board your own luxury yacht, evenings in the Mediterranean should always mean dressing up. Compliment azure sunset skies and turquoise seas with Preen's vibrant one-shouldered dress; just be sure to drape Stella McCartney's dramatic cape from your shoulders to ward off any chilly sea breezes. Accessories should make a statement - a pair of classic Rene Caovilla heels, a Ralph & Russo clutch, Boodles earrings and an elegant Chopard Happy Diamonds watch are the perfect finishing touches. The bright sunshine and pastel hues traditionally associated with the Mediterranean coastline make it ideal for injecting a little colour into your casual wardrobe. Opt for a stylish twist on the nautical theme with lightly patterned blue swim shorts from Vilebrequin; we suggest opting for a tailored pair that won't look out of place for al fresco dining or spontaneous jaunts ashore. 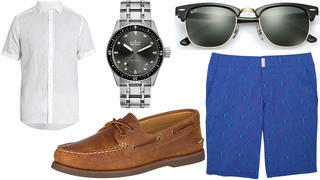 Wear with a relaxed Etro white shirt, classic deck shoes from Sperry Top-Sider and Ray-Ban's iconic Clubmaster sunglasses for an effortless holiday look. Of course, no yacht style is complete without a diving watch. Our pick of the moment is Blancpain's Fifty Fathoms Automatic Bathyscaphe. Opt for tan, instead of black or dark brown, accessories. 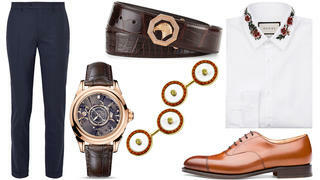 A pair of classic Church's lace-ups and a luxurious Stefano Ricci leather belt will remain useful long after the summer has passed and the lighter shade feels much chicer in warmer climes. Finish with something flashy yet understated on your wrist; a limited edition version of Omega's De Ville Tourbillon Co-Axial will do the job nicely.